Holy objects and extensive offerings at Kachoe Dechen Ling. Photo by Chris Majors. The Holy Objects Fund provides the resources to create holy objects for world peace. The creation of holy objects for world peace is a very high priority among Lama Zopa Rinpoche’s Vast Visions for the FPMT organization. My wish is for FPMT to build many holy objects everywhere, as many as possible. Making it so easy for sentient beings to purify their heavy negative karma and making it so easy for sentient beings to create extensive merit. Which makes it so easy to achieve the realizations of the path and so easy to achieve liberation and enlightenment. Holy objects purify negativities and create merit for all who come into contact with them. 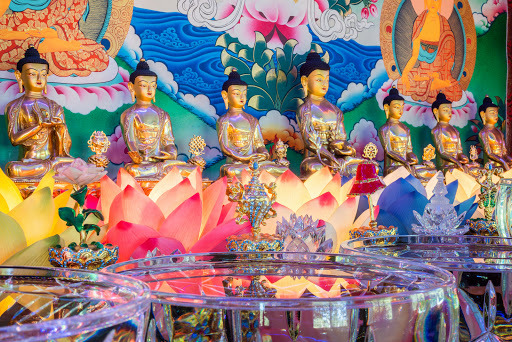 By contributing toward the building of statues, stupas, prayer wheels and large thangkas the Holy Objects Fund contributes to world peace and harmony in a very unique way. 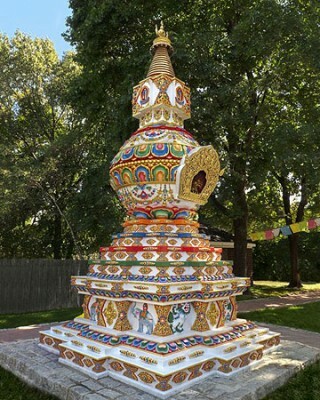 Kalachakra Stupa at Kurukulla Center, Massachusetts USA. Building 100,000 stupas for world peace is one of Lama Zopa Rinpoche’s wishes for the FPMT organization. Rinpoche explains that since there is unbelievable benefit from holy objects, the organization should aim to build 100,000 stupas (minimum size, one story, up to the distance from the earth to the moon) in different parts of the world. To date 49 stupas have been built or are in the process of being built … only 99,951 remain to be built. Stupas are powerful symbols of the mind’s limitless potential. They represent the mind of enlightenment. You can learn more about our work supporting stupas. Building stupas helps develop so much peace and happiness for numberless sentient beings. As a result, wars, disease, and desire will all be pacified. Instead of feeling hopeless, people will gain courage. This is about peace – for the beings who see it, for the whole country, for the entire world, for all sentient beings. The Great Prayer Wheel at Land of Medicine Buddha. Lama Zopa Rinpoche has explained that he would like to sponsor the building of 100,000 prayer wheels for world peace (including prayer wheels under the ocean). 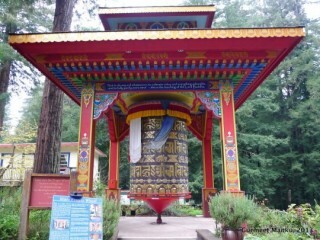 The prayer wheels are to have a minimum height of six feet. Wherever a prayer wheel is built, it becomes a great blessing for that country. A prayer wheel is a cylindrical wheel on a spindle made from metal. Inside the prayer wheel are many million or billions of the mantra of the Buddha of Compassion, OM MANI PADME HUM, printed on paper or microfilm. By turning the prayer wheel the mantra of compassion emanates and blesses the area and all beings. You can learn more about our work supporting prayer wheels. Simply touching a prayer wheel brings great purification of negative karma. Turning a prayer wheel containing 100 million OM MANI PADME HUM mantras accumulates the same merit as reciting that many mantras. 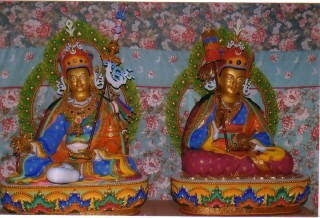 Lama Zopa Rinpoche has expressed that he would like to contribute toward the building of large statues around the world, specifically of Padmasambhava and Maitreya Buddha. The Padmasambhava Project for Peace is sponsoring the building of many large statues of Padmasambhava around the world in order to create the cause for peace for all beings. To date 19 statues have been built, one measuring 70 feet (21 meters) high. 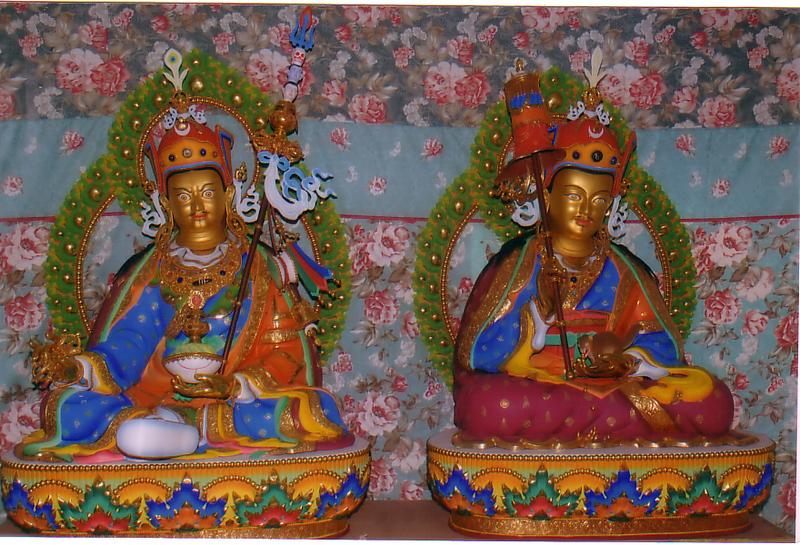 You can learn more about our work supporting Padmasambhava statues. Building Guru Rinpoche statues will bring immeasurable benefit, peace, happiness, and freedom to the world. They will have immeasurable impact. A scale replica of the Maitreya Buddha statue to be built at Kushinagar, India, Photo by Andy Melnic. Lama Zopa Rinpoche has requested the FPMT organization to contribute towards the building of 1,000 Maitreya statues (the minimum size should be 6 feet). This includes the Maitreya statues planned to be built in Kushinagar and Bodhgaya, India. The aim is that the large Maitreya Buddha statue to be built in Kushinagar should be designed to a minimum of a 1,000 years. As explained by Rinpoche the benefit will be that for every day for at least 1,000 years, infinite sentient beings will receive unbelievable benefit and the causes for enlightenment. 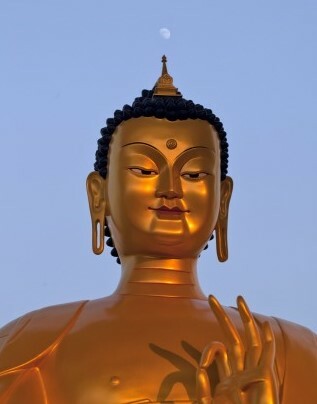 By contributing to the building of Maitreya statues, whether it be money or time, one makes a connection with Maitreya Buddha, and the result is that one becomes a direct disciple of Maitreya Buddha when Maitreya returns to manifest enlightenment. You can learn more about the Maitreya Project. 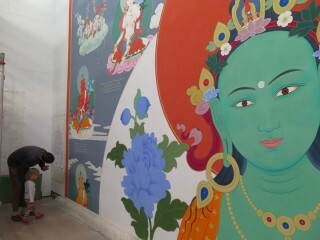 21 Taras thangka is 14 meters high and 9 meters wide is being painted by artist Peter Iseli in France. 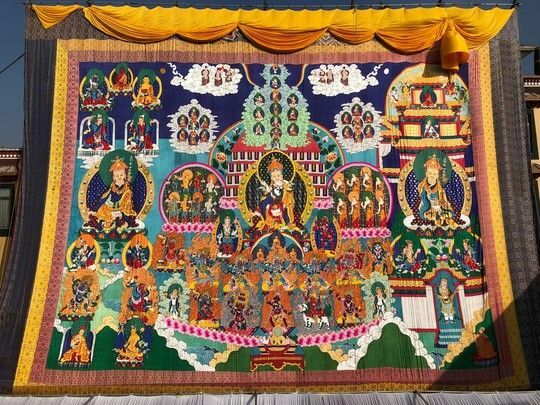 Lama Zopa Rinpoche has expressed the wish that the bigger FPMT centers have large thangkas which can be displayed and enjoyed by the community on festival days and during special events. In this way, by seeing the thangkas it is a way to leave imprints for enlightenment for all the people who view them. Thangkas are painted or appliquéd depictions of Buddhas, deities and venerated spiritual figures, usually framed by brocade. You may think that a statue or thangka is just a statue or thangka, but it is the transcendental wisdom of dharmakaya, which understands and directly sees absolute truth, as well as conventional truth. Or simply send your check in US dollars payable to FPMT Inc. and write “Holy Objects Fund” on the memo line. The Holy Objects Fund is a project of FPMT Inc. and is administered by FPMT International Office located in Portland, Oregon, United States. All donations made to this fund are tax-deductible within the United States in accordance with IRS Code article 501(c)(3) to the extent allowed by law.